A handful of people impact your life far beyond what any others do. Uncle Roy is one of those handful for me. He is a gift from God to my life over the decades. In the picture above Uncle Roy presents me with the gift my daddy gave me 53 years earliers. It was Christmas 1959 and my daddy was sick. 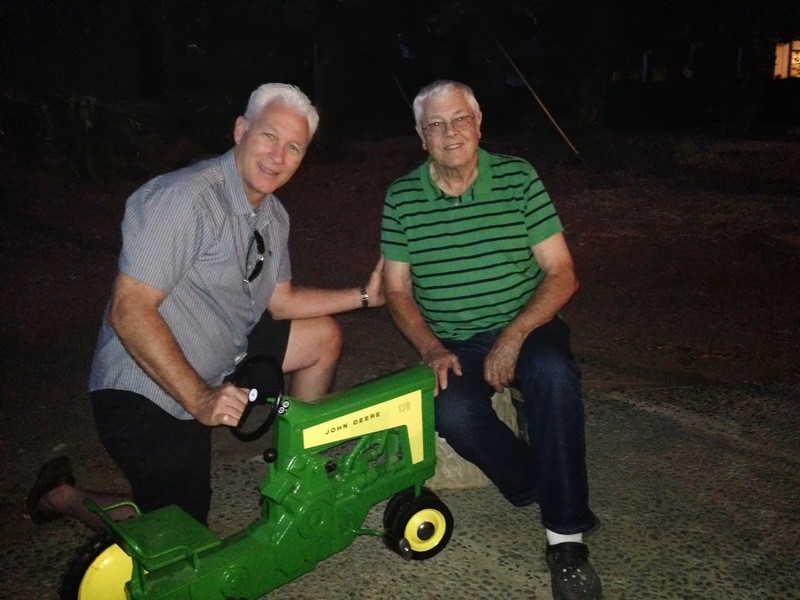 For Christmas he gave me a John Deere tractor I could ride on and pedal. I was 2 years old. 3 weeks later daddy died. Uncle Roy took a special interest in me. For the past 53 years I have been the grateful recipient of his godly example, his wisdom, his generosity, his prayers and his love. Recently he moved from his small town of Hugoton Kansas where he had lived for 80 years, to La Habra, CA...the LA suburb. What a daring move for someone headed to their finish line. He moved next door to my cousin. At a family gathering to welcome them to our "neck of the woods" he surprised me with my "restored" tractor. He had brought it from Kansas to share with me. My life has been enriched by my Uncle Roy. I did nothing to merit or deserve his love. I did not choose the family I was born into. I can simply receive his love and rejoice....and ain't that just like God's GRACE? !